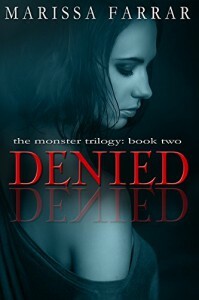 I really enjoyed Denied, which is part two in the Monster Trilogy. Although Denied does fill you in on some of the things that took place in Defaced, I strongly recommend you read these in order, as I feel you will get the most out of them that way, as we mostly get to know about the main characters, Lily and Monster in part one. I would like to thank the author for a copy of this book, in exchange for an honest review.